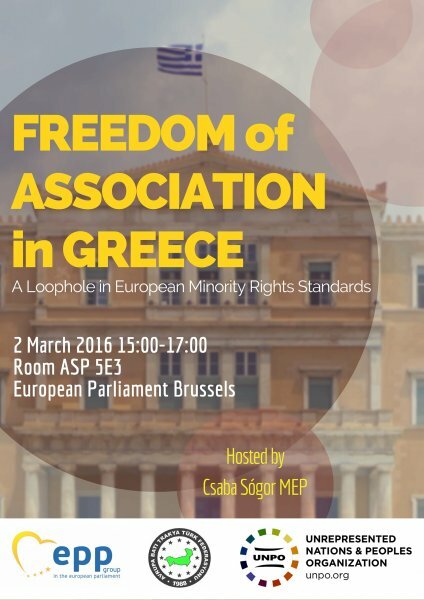 On 2 March 2016, Csaba Sógor MEP (EPP) in cooperation with the Federation of Western Thrace Turks in Europe (ABTTF) and the Unrepresented Nations and Peoples Organization (UNPO) will be convening a high level conference entitled ‘Freedom of Association in Greece: A Loophole in European Minority Rights Standards’ at the European Parliament in Brussels, Belgium. While respect for the rights of persons belonging to minorities is one of the core values of the EU – a value the Union has committed to promoting and protecting worldwide – there still remains a large discrepancy between policy and practice even within EU Member States. One of the most alarming accounts can be found in Greece, where ethnic minorities are being deprived of one of their fundamental human rights: freedom of association. This has been expressed, amongst others, through the banning of some associations bearing a name with the word ‘minority’ or a name of an ethnic group. Despite several rulings by the European Court of Human Rights upholding that the Republic of Greece is violating the rights of freedom of assembly and association of its national minorities, Greek authorities have for more than a decade delayed their implementation and refrained from amending the Code of Civil Procedures. This conference will bring together politicians, minority representatives, experts, and civil society to discuss the overlooked violations of freedom of association in Greece from the perspective of various minority groups in the country. It will also seek possible ways forward in addressing the lack of implementation of international law and ECtHR rulings, as well as analyse the effectiveness of European regulations for the protection of minority rights.